Posted by jeremyliew in browsers, desktop apps, Internet, social media, start-up, startups, web 2.0. The wave of the future is not web browser applications. Instead we’re coming full circle back to desktop applications, but this time we’ve broken the old idea of single user silo applications with no connection to the outside world. The wave of the future is lightweight desktop applications with the same massively networked, Web 2.0 behavior we’ve come to expect from browser applications. She goes on to give several examples, including iTunes and Songbird. Its an insightful comment. We’ve tended to think of “Web 2.0” as encompassing both rich web applications (vs. desktop applications) and social media, but there is no reason why these two things have to be intertwined. We’ve seen a number of non-social websites embrace rich web applications, and so its no surprise that we’re also seeing desktop apps (or plug-ins to desktop apps) also embrace social aspects. These are apps that work well for a lone user, but even better when the user joins a network. Om Malik recently covered one of our portfolio companies, WeFi, that takes a similar approach. Just as Songbird’s primary functionality is as a desktop music player, but social aspects can improve the experience, so too WeFi‘s primary functionality is as a better WiFi connectivity manager (and against Win XP, that isn’t a high hurdle! ), but social aspects can improve the experience. A lone user gets an easier and quicker experience for identifying and signing onto any hotspot, as well as better management control over hotspots that they own. As he joins a network, he gets to roam on other private hotspots, as well as the ability to find both his friends, and wifi hotspots on a map, relative to his location. Another company enriching desktop apps with social functionality is Me.dium. Me.dium is a browser plugin that helps a lone user to see websites related to the current website being viewed. But when that user joins a network, she gets to see what sites her friends are browsing in real time, and how they are moving from site to site, adding a social dimension to relevance. I’d be interested to hear from readers about other desktop apps that are taking a social approach. Posted by jeremyliew in business models, Consumer internet, distribution, Ecommerce, Internet, media, social media, social networks, user generated content, viral, viral marketing, web 2.0, widgets. As I’ve said in the past, I think that distribution is the most important success factor in the early stages of any new consumer technology. Distribution used to mean getting a carriage deal done with a big portal. These days it can take a number of forms, but it always requires getting in front of potential users who may not be aware of you, and alerting them to your value proposition. As social networks take an increasing percentage of internet users time, it’s more important than ever to factor them into a distribution strategy. Within Myspace, this has been through widget virality (one of the seven forms of virality that we’ve posted about in the past). Bebo has taken a more controlled approach, allowing select partners into their system in what looks closer to a traditional portal distribution deal. Now, through its new platform, Facebook too can be a distribution platform. Apps are spreading in Facebook through a combination of virality from profile pages, promotion to existing user bases and position in the application directory, with iLike being the clear early winner. Happily for Lightspeed, Rock You and Flixster (both are portfolio companies) have three of the top ten apps on Facebook between them. Josh Kopelman says that Facebook’s open approach to partners has effectively increased their virtual R&D budget by around $250m, the amount invested so far into widget companies. Another of our portfolio companies, Stylehive, is also taking the approach of opening up its platform (albeit on a smaller scale to Facebook). They are partnering with retailers and publishers, including the Gap, Shopbop, Instyle Magazine, Gen Art and others, inviting them into the Stylehive platform. These partners will be able to access Stylehive’s community as well as add a social media dimension to their commerce or content. I think we’ll see even more communities opening themselves up as platforms over the next 12-18 months. It will be especially interesting to watch MySpace’s competitive response. Posted by jeremyliew in advertising, Consumer internet, social media, social networks, user generated content, web 2.0. It suggests that this demographic is more receptive to advertising on UGC sites in “high fun” categories such as music, movies, food, apparel and entertainment than it is to advertising on general media sites. For “high expenditure” items (travel, autos, etc) their responsiveness is about equivalent between UGC and general media sites, but for “high trust” items (healthcare, financial services) they prefer general media. Movies/Music/Entertainment features prominently in both charts. Hopefully this bodes well for our portfolio company Flixster! 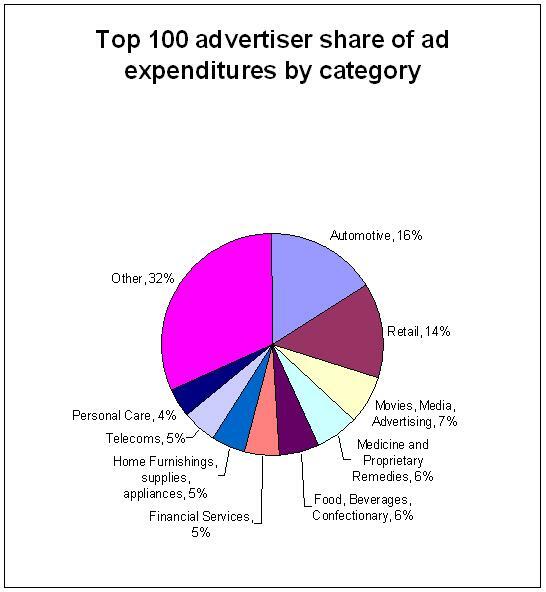 More generally, note the categories where there is both a lot of advertising and a lot of consumer passion. Its these areas where explosive growth of user generated content and social media can combine with an online media model that works. When you overlay the criteria of reasonable receptiveness of the audience to advertising within social media channels, it suggests that other than in movies/music/entertainment, other categories with potential include apparel (we’re an investor in Stylehive), food/beverage, travel and auto. I would be interested to hear from social media companies with meaningful traction in any of these categories. Posted by jeremyliew in advertising, Consumer internet, Internet, media. Well it was a busy week last week, what with WPP agreeing to buy 24/7 and Microsoft agreeing to buy Aquantive. I was on vacation overseas, so didn’t get a chance to post my thoughts on it as it happened, but there was a lot of thoughtful coverage. Since these deals came hard on the heels of Yahoo’s acquisition of Right Media and Google’s acquisition of Doubleclick last month, most of the coverage was in the vein of “watch everyone play catchup to Google”. I have a slightly different take on this spate on transactions. I think that in the case of Yahoo and Microsoft, they are actually playing catchup to AOL’s acquisition of Advertising.com in 2004. This happened under Jon Miller’s watch (I was his chief of staff at the time). It has since proved to be a prescient deal. It is no accident that AOL was the first big portal to move to acquire an ad network as they were the first to experience the trend of deportalization. 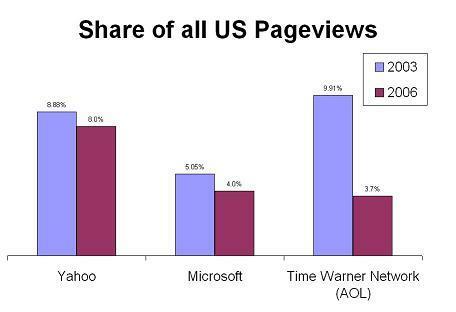 The big three portals (Yahoo, MSN, AOL) are losing share (of total US pageviews), as the chart below shows. They will likely never regain their lost share – their tried and true techniques of recycling traffic into their own sites don’t work anymore. Users want best of breed content and, thanks to search, they can get it – within or without the portals. Its been well documented that both Yahoo and MSN have seen flat/negative advertising revenue growth in the last few years. 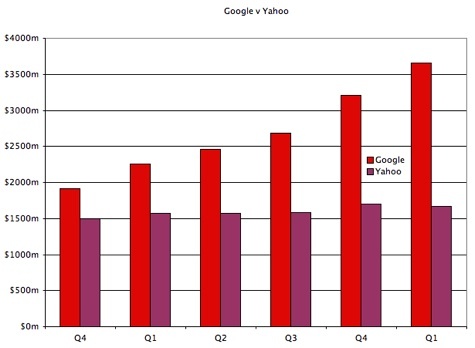 See the below chart from Valleywag for a comparison of Google vs Yahoo gross revenues for the last few quarters. AOL has fared better because it opened up its proprietary content, so its year on year comps look better, but it took its traffic hit earlier and will likely start to see similar trends once the growth spurt generated by opening up AOL’s content to the web slows down. Public companies must show growth. If you can’t grow by selling your own inventory, then you’re forced to sell other people’s inventory. That was the driver of AOL’s acquisition of Advertising.com, and it’s the driver of Microsoft and Yahoo’s recent acquisitions as well. It also explains the prices that they paid, which some fear to be too high. Fear of loss is always a greater motivator than the prospect of gain. The big portals are looking down the barrel of a loss of their share of total pageviews, and are willing to fight hard (i.e. pay up) to avert that loss. Posted by jeremyliew in advertising, Consumer internet, international, Internet, start-up, startups, web 2.0. For many US based startup online media companies, intenational users are largely an afterthought. As I am an Australian, this has always annoyed me. But it is becoming increasingly clear, much as it pains me, that US based startups are right to focus on their home market. When it comes to creating value, non-US users largely don’t matter to them. I was looking at some research pulled together by Yazid Aksas, a student at Stanford Business School. He pieced together estimates for the 2007 internet advertising market size and the number of internet users in each of the ten countries with the most internet advertising in the world, from various sources*. 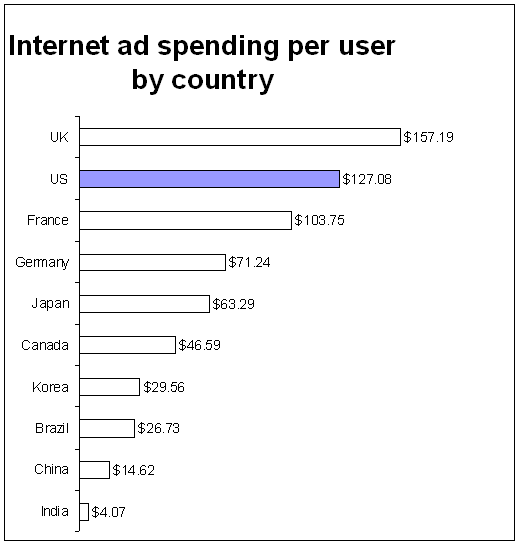 Interestingly, although the US is close to the top of the list, most of the G8 show high ad spend/internet user (with Russia and Italy being the unsurprising exceptions). The UK is even 20% higher than the US. This suggests that there are sizable online media businesses to be built in each of these countries. Why then are Bebo and Piczo so focused on building their US user bases? Their home in the UK, where they have the most strength, is the market that spends more in online advertising per user than any other in the world! The answer lies in the absolute size of these online ad markets, and the extremely high economies of scale in the advertising business. At $19.5bn, the US is four times bigger than the next biggest market, and bigger than all the other markets combined. 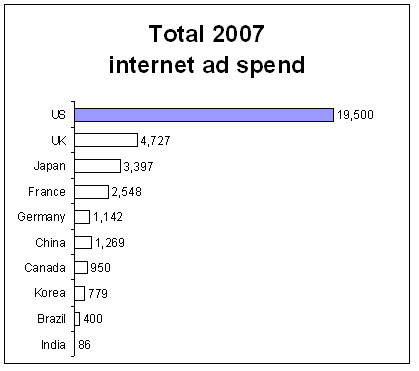 Internet advertising, like all advertising, is bought on a country by country basis. The fixed costs of setting up a sales office are going to be roughly the same in any country. Given that the upside opportunity is so much bigger in the US, and given that startups need to focus, its no wonder that most US based online media startups focus on their home market. There is more than enough opportunity to build a business here without worrying about the complexities of other geographies. More mature companies, which can undertake multiple independent initiatives, do start attacking some of the other international markets. Myspace has been very focused on rolling out new geographies in the last twelve months as it can leverage a mature world wide ad sales force through its Fox/News corporate parent. Online media companies that start outside the US tend to be more international in their outlook from the beginning. This may be a reflection of a greater international awareness among European and Asian entrepreneurs, or it may be simply a reflection of smaller domestic markets. Successful startups may outgrow their smaller domestic markets sooner, forcing them to turn to new geographies if they want to maintain their growth. Some of the new generation of European internet startups that have been most aggressively international include Tradedoubler, Skype, Netvibes, Joost, Jahjah, and Wikio (a Lightspeed company) and it is likely no accident that these companies were all founded in countries with a smaller domestic online advertising market. Can any readers provide some counter examples of US based companies which deliberately targeted an international market before attacking the US? (Friendster‘s South East Asian bias, Orkut‘s Brazilian bias and Hi5‘s Indian bias don’t count since they were not deliberate). if so, please comment. Posted by jeremyliew in business models, Consumer internet, local, media, newspapers. Walter E. Hussman Jr., the Publisher of the Arkansas Democrat-Gazette (the major paper in Little Rock), wrote a fascinating opinion column in today’s Wall Street Journal (subscription required) entitled “How to Sink a Newspaper“. He take a contrarian view to the prevailing trend for newspapers to embrace the web and make their content free to drive more online users. Indeed the Newspaper Association of America recently released a report saying that newspaper websites are growing twice as fast as other websites. One has to wonder how many of the newspaper industry’s current problems are self-inflicted. Take free news. News has become ubiquitous, free, and as a result, a commodity. Anytime you are trying to sell something that becomes a commodity, you have lost much of the value in providing that product or service…. All of this would be fine if newspapers generated lots of additional revenues from offering free news. But the fact is newspapers generate most of their online revenues from classified advertising, not from news…. It turns out that a Web site is a very different medium from a newspaper. While consumers often find pop-up ads a distraction and banner ads as more clutter, readers often seek out the advertising in newspapers…. So what are we doing with our Web site? We have hired a videographer to complement our text coverage in the newspaper. We have added photo galleries to increase the number of photographs beyond what we can publish. We offer an electronic edition where you can search the entire edition by keywords, something you can’t do in the print edition. And we offer breaking news email alerts, something else you can’t do in print. In other words, we are offering value on our Web site that complements, rather than cannibalizes, our print edition. Collectively, the American newspaper industry spends $7 billion on news and editorial operations. This includes everything from copy editor salaries to sports travel expenses. In addition, the Associated Press spent about $600 million world-wide in editing and creating news. By offering this news for free, and selling it to aggregators like Google, Yahoo and MSN for a small fraction of what it costs to create it, newspaper readership and circulation have declined. …it is not just the newspaper industry that gets hurt. Journalism will be diminished in America with less investigative and enterprise reporting; indeed, less reporting of state houses, city halls, school boards, business and sports. Clearly a lot is at stake. Hussman provides some data to back up his contentions, citing growth in his newspaper’s paid circulation against industry wide declines, and showing relatively better performance than the Columbus Dispatch (a comparable paper) in the 6 months after the Dispatch switched their website from free to pay. Before reflexively dismissing Hussman as an old media dinosaur that “just doesn’t get it”, its worth while considering another newspaper transaction that is in the public eye, News Corps bid for Dow Jones and the Wall Street Journal. Since Murdoch bought MySpace, a move that earned him first ridicule, then praise, it is hard to accuse him of being an old media dinosaur. And as Hussman points out about the WSJ online, it has almost one million paying subscribers, more than all but three US newspapers (USA Today, WSJ and NY Times). Even the opinion piece that I’m quoting can’t be read unless you’re one of these one million! Hussman gets to the core of an important point, but I disagree with him on the nuances. I don’t think that news has become a commodity because newspapers make it free. Rather, I think that news is free because its a commodity. In a world of wire news, where you read the story hardly matters. For most breaking news, a rewrite of a wire story by a staff reporter is not enough to differentiate one newspaper from another. One could argue that the wires shouldn’t sell to outlets other than newspapers, but that cat is well and truly out of the bag. The important thing that allows papers like the WSJ, and like the Arkansas Democrat-Gazette, to continue to charge for subscription is that the content that they have is NOT a commodity. The journal covers business news to a depth and breadth that no other US paper does. It adds insight and analysis. What you read in the journal you often CAN’T read elsewhere. Similarly, I imagine that readers/subscribers of the Democrat-Gazette online are not turning to it for news on Iraq or the election, or topics that are well covered elsewhere, but rather news about local issues in Little Rock and in Arkansas that are NOT covered elsewhere. Its the local paper’s coverage of local news that allows it to hold its audience – not its coverage of commodity news. The advice I would give to Huffman would be to take all the rest of his content, the commodity news (International, National, Business etc) and put that outside the pay wall and see what happens. He might be pleasantly surprised. Posted by jeremyliew in Consumer internet, Ecommerce, Internet, start-up, startups, user generated content, web 2.0. On Friday Om Malik put up an interesting post about how small companies can now fully benefit from the internet in a way that was once open to only companies at greater scale. In his article Om namechecks Moocards (mini “personal” cards, personalized with your pictures or avatars), Spreadshirt and Skinny Corp/Threadless (both user created and curated t-shirt retailers), JPG magazine (print photography magazine, with user created and curated photos), and CastingWords (marketplace for audio to text transcription). The other interesting thread through these companies is that they all connect the online and the offline. To some extent, almost all e-commerce companies connect the online (transaction) with the offline (fulfillment). Most retailers instinctively grasped that the internet was just a new channel, and today the Internet Retailer top 500 is dominated by multichannel retailers who started in bricks and mortar or catalogs. Small business entrepreneurs running everything from hardware stores to strip mall blinds stores have grasped the opportunity that the internet represents, and launched profitable businesses online doing tens of millions in revenue. We’ve even seen movement the other way, with e-tailers sending catalogs or even opening stores. Marketers too have known instinctively that they need to blend their online and offline campaigns together. From the earliest days of the internet, AOL partners were required to add their “AOL Keyword” to their offline advertising, and when I was at Citysearch in ’96, one of the things we made sure to tell our small business customers was to put their URLs in their business cards, menus, letterhead and other paraphernalia. Today you’ll be hard pressed to find an ad in a magazine or on a billboard that doesn’t include a URL. Furthermore, manufacturers, who are one step removed from their consumers, are starting to use the internet to connect directly with their end users. I’ve posted in the past about how companies such as General Mills (cereal), Ganz (plush toys) and Mattel (Barbie) have all set up casual immersive worlds where their endusers can connect with these brands and each other. Even the two mainstays of the internet, Communication and Community, have found ways to cross over to the offline world. Mobile access to the internet via cellphones is further blurring the distinction between online and offline companies. Photo mobile blogging sites like Fotolog and Radar continue to grow, with Fotolog currently at an Alexa rank of 24th in the world. Cell phone users are using their mobile phones to snap pictures of 2d barcodes to access information about the real world, to get alerts of sales in the mall that they are in, or to keep track of their spending. I think we’ll be seeing an increasing blurring between online and offline as the internet becomes more of the fabric of people’s daily lives. More examples of companies who are blurring this line are welcome in comments. Posted by jeremyliew in Consumer internet, gaming, social media, social networks, user generated content. On April 29th, 2007, the Boston Globe published an interesting article in praise of peer pressure. Coming shortly on the heels of the NY Times article about cumulative advantage, it gives a separate set of examples on how to use the public display of popularity to shape user behavior, a topic I covered in a recent post. Based on research by Robert Cialdini, the article gives examples of how sharing data on behavior norms can help curb unwanted behavior in fields as diverse as vandalism of national forests to drinking on college campuses or getting hotel guest to reuse towels. Cialdini’s book “influence: The Psychology of Persuasion” was one of the few books from business school that I’ve gone back to read repeatedly. Its worth checking out if you haven’t already. * Social Proof – People will do things that they see other people are doing. For example, in one experiment, one or more accomplices would look up into the sky; bystanders would then look up into the sky to see what they were seeing. At one point this experiment aborted, as so many people were looking up that they stopped traffic. * Liking – People are easily persuaded by other people that they like. Cialdini cites the marketing of Tupperware in what might now be called viral marketing. People were more likely to buy if they liked the person selling it to them. Some of the many biases favoring more attractive people are discussed. Reciprocation: Thanks for the add! and Facebook‘s gifts. Commitment and Consistency: No wonder brands, bands and politicians love to be “friended” – user affiliation marketing is stronger because of this effect. I’d love to hear about more examples in comments! Posted by jeremyliew in Consumer internet, gaming, social media, social networks, user generated content, web 2.0. … if people know what they like regardless of what … other people like, the most successful songs should draw about the same … market share in both the independent and social-influence conditions … And … the “best” ones … should become hits in all social-influence worlds. … we found… exactly the opposite. In all the social-influence worlds, the most popular songs were much more popular … than in the independent condition. At the same time, however, the particular songs that became hits were different in different worlds… Introducing social influence into human decision making, in other words, didn’t just make the hits bigger; it also made them more unpredictable. … intrinsic “quality,” which we measured in terms of a song’s popularity in the independent condition, did help to explain success in the social-influence condition. … But the impact of a listener’s own reactions is easily overwhelmed by his or her reactions to others. … Because the long-run success of a song depends so sensitively on the decisions of a few early-arriving individuals, whose choices are subsequently amplified and eventually locked in by the cumulative-advantage process, and because the particular individuals who play this important role are chosen randomly and may make different decisions from one moment to the next, the resulting unpredictability is inherent to the nature of the market. You can see these same processes at work in social bookmarking and ranking services like Digg and Del.icio.us. Individual users rate a site as being interesting, causing other users to visit it and, in turn, assess whether the site is interesting enough to rate it as interesting. Over time, certain sites gain momentum and rise to the top of the heap, even though most individuals only ever see a small fraction of the options. There is a bit of an implication that the BEST sites rise to the top due to these social processes – a sort of “Wisdom of the Crowds” effect. Others have posted in the past about why the Wisdom of Crowds fails on Digg. 4. Aggregation. You need some way of determining the group’s answer from the individual (i.e. unbiased) responses of its members..
Digg fails on all four of these criteria; it is not a completely diverse group of users, Digg intrinsically influences its users’ opinions, there are certain Digger’s who have more power to push a story to the front page than others, and Digging does not occur in a vacuum. Groups will do better than individuals in choosing a correct answer, and big groups better than little ones, as long as two conditions are met: the majority response “wins,” and each person is more likely than not to be correct. In a large enough sample set of options, the likelihood that a person can choose the “best” article or “best” song rapidly drops below 50%, so this second criteria fails. 2. If you’re trying to create “hits” out of some of your content (and don’t care if it’s the “most worthy” content – you only care that they are hits), then display feedback and popularity constantly, as this will effect user behavior and exacerbate the size of the hits (e.g. Youtube, Digg, American Idol? 3. If you want to “guide” user behavior in a certain direction, provide feedback that validates or shows the popularity of that behavior. This is consistent with my prior post on game mechanics applied to social media: keeping score. Can you think of more examples of these three best practices? If so, please add them in comments.